I first met with Ciara and her young daughter at Eddie Catz, and now every time I’m there with My baby girl, I think of them both. Meeting Ciara for the first time, I felt quite nervous - at the time she ran an online vintage dress boutique - Dita Florita, which I had admired since it’s opening - why would she need me!!? Ciara admitted that she didn’t know exactly what she wanted, and didn’t know what would suit her. I asked Ciara to compile some inspirations of things she liked, and despite saying that she wouldn’t usually look for too much embellishment, lots of the inspirations that Ciara picked out, were beaded and embellished quite heavily. The one detail Ciara knew she wanted was a revealing back, and a bow (one my favourite things!). I played around with fitted bodices which weren’t corsetted, and flowing skirts which weren’t too voluminous!, and adding some embellishment which wasn’t too blingy. 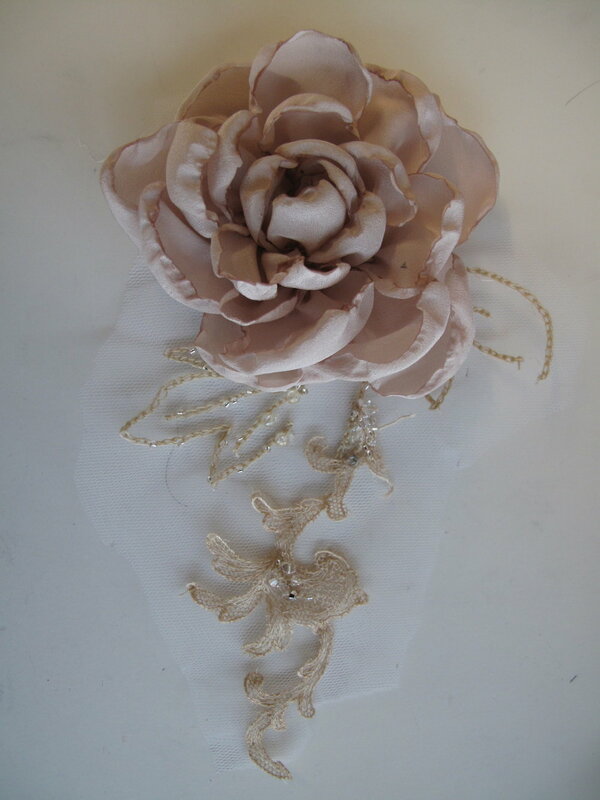 I loved the idea of a lace design which had different layers and elements to it, but applying it quite organically as though growing, so I mixed a piece of antique lace, dyed to contrast and blend with the pretty pink champagne blush silk we picked with hand embroidered leaf shapes and beaded with subtle clear and silk-coloured Swarovski crystals and beads, and appliqued onto sheer organza so that the effect of the embroidered straps would not be ruined by a hard-edged fabric. The lace embroidery curled into tendrils onto the bodice where the straps met. For the matching waistband embroidery, I became set on the idea that the central motif should be a heart shape, which Ciara allowed me to do as long as it wasn’t too ‘cute’! I asked Ciara what kind of flowers she likes, so that I could make a pretty corsage “Peonies” was the answer - oh!?? How do I make those!!? Sometimes creative answers surprise you; I happened to be burning scraps of fabric on a flame, and they curled up into perfect little Peony petals - perfect! This idea was then extended to make mini sequin Peonies. This sounds like quite a lot, of different detail but each subtle detail added to the whole. I loved the fabrics used, a matte crepe for the fitted halter-bodice, and satin chiffon for the skirt, so luxurious and rich, which feels beautiful to touch. Ciara’s make up look was created by Ana Ospina MUA, who specializes in air brushing techniques.